SAN JOSE, Calif., Feb. 21, 2017 /PRNewswire/ -- Xilinx, Inc. (NASDAQ:XLNX) today announced a disruptive integration and architectural breakthrough for 5G wireless with the infusion of RF-class analog technology into its 16nm All Programmable MPSoCs. 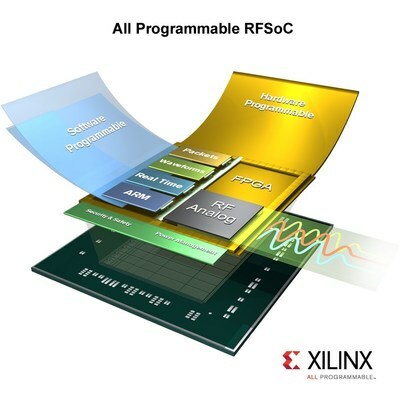 Xilinx's new All Programmable RFSoCs eliminate discrete data converters, providing 50-75% power and footprint reduction for 5G massive-MIMO and millimeter wave wireless backhaul applications. Large scale 2D antenna array systems will be key to the increase in spectral efficiency and network densification needed for 5G. Manufacturers must find new ways to meet stringent requirements for commercial deployment. With the integration of high performance ADCs and DACs in an All Programmable SoC, radio and wireless backhaul units can now meet previously unattainable power and form factor requirements, while increasing channel density. Additionally, RFSoC devices allow manufacturers to streamline design and development cycles to meet 5G deployment timelines. "The shift to FinFET technology blends high integration density with improvements in analog device performance characteristics," said Boris Murmann, Professor of Electrical Engineering at Stanford University. "This enables the integration of leading-edge analog/RF macros using a digitally assisted analog design approach." "The RFSoC solution from Xilinx is a game changer in the RRU/massive MIMO active antenna array market," said Earl Lum, President, EJL Wireless Research. "It also allows the company to become the preferred digital solution provider to this market for current and next generation 4G, 4.5G and 5G wireless networks." "Integrating RF signal processing into All Programmable SoCs enables our customers to dramatically change their systems architectures. It also continues the Xilinx imperative for continuous, breakthroughs in system integration," said Liam Madden, Corporate Vice President, FPGA Development and Silicon Technology at Xilinx. "This will effectively enable our 5G customers to commercially deploy highly differentiated, large-scale, massive-MIMO and millimeter-wave backhaul systems. Our new RFSoC architecture comes at the perfect time, addressing this urgent problem in 5G development." Xilinx is the leading provider of All Programmable FPGAs, SoCs, MPSoCs, RFSoCs and 3D ICs. Xilinx uniquely enables applications that are both software defined and hardware optimized – powering industry advancements in Cloud Computing, SDN/NFV, Video/Vision, Industrial IoT, and 5G Wireless. For more information, visit www.xilinx.com.